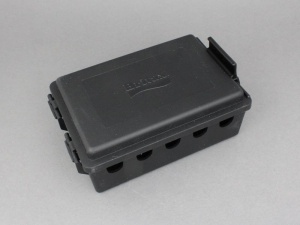 10-way weather proof junction box with hinged lid and rubber seal that is particularly useful for wiring trailer lights. 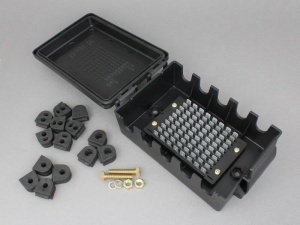 This tough box contains 80 x 6.3mm male blade terminals ( 10 rows of 8) mounted in the base of the box and the terminals in each row are electrically common. 10 cable entry points along the sides of the box can be fitted with the supplied rubber grommets to fit various round and flat cable profiles or act as blanks to seal un-used ways. 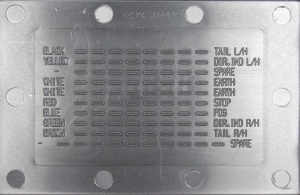 The box can be mounted using the M6 bolts, lock-nuts and washers supplied. Fitting instructions also included. good piece of kit at right price quickly delivered. This is a well made item that makes wiring up a trailer easy and should prove reliable. It may seem expensive compared to a bit of chocolate block and a plastic box, but it is worth the extra. 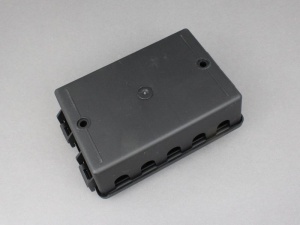 The matrix makes checking the electrics straightforward and the box comes with good quality fixings and grommets.